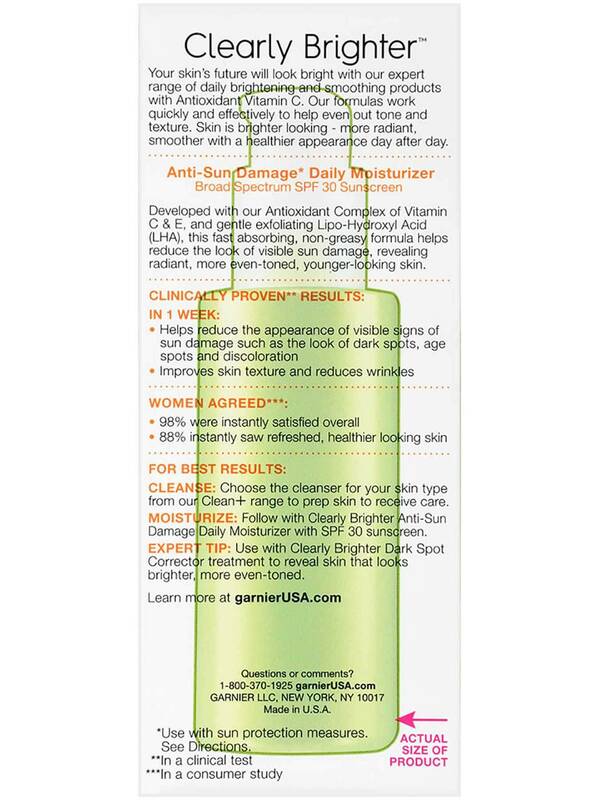 Helps reduce the look of dark spots and other signs of sun damage. Developed with our Antioxidant Complex of Vitamin C & E, and gentle exfoliating Lipo-Hydroxyl Acid (LHA). This fast absorbing, non-greasy formula helps reduce the look of visible sun-damage, revealing radiant, more even-toned, younger-looking skin. For external use only. Do not use on damaged or broken skin. When using this product keep out of eyes. Rinse with water to remove. Stop use and ask a doctor if rash occurs Keep out of reach of children. If swallowed, get medical help or contact a Poison Control Center right away. Inactive ingredients: Water, glycerin, silica, dimethicone, PEG-100 stearate, glyceryl stearate, ammonium polyacryloyldimethyl taurate, ascorbyl glucoside, benzyl alcohol, benzyl salicylate, butylene glycol, capryloyl salicylic acid, caprylyl glycol, citral, dicaprylyl carbonate, dimethicone/vinyl dimethicone crosspolymer, dipropylene glycol, disodium EDTA, fragrance, geraniol, limonene, linalool, myristic acid, nymphaea alba flower extract, palmitic acid, phenoxyethanol, phenylethyl resorcinol, sodium hyaluronate, sodium hydroxide, sodium palmitoyl proline, steareth-100, stearic acid, t-butyl alcohol, tocopherol, xanthan gum, fragrance. Rated 5 out of 5 by jenbrooke from Fantastic! I am not sure if this is intended as just sunscreen or what, but it is honestly the best moisturizer I've had in years. I *thought* I had sensitive oily/flaky skin and hadn't found anything that worked. 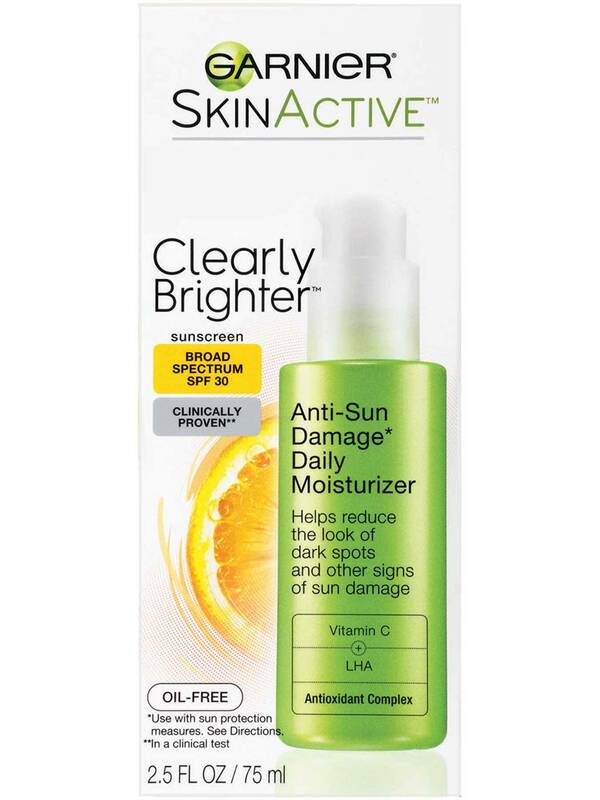 The most recent product I tried for 6 months had no sunscreen in it, I thought maybe the sunscreen was the issue, but the moisturizer was a bust and I felt exposed in the AZ sun, so I tried this on a whim getting it at CVS. OMG!! My skin hasn't felt this soft, smooth and firm in years. I absolutely love it. I'm not a person to write reviews often, but I'm feeling so good I am inspired. Rated 3 out of 5 by rin rin from Sunscreen or Moisturizer? I’m not certain if this product is sunscreen or if it’s a moisturizer? 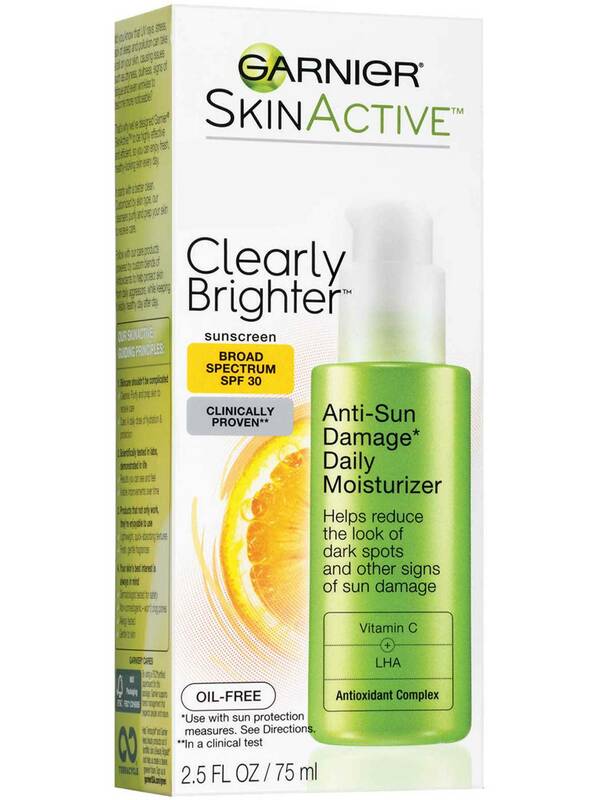 It comes out like a sunscreen but on the box it shows it as a moisturizer but with sunscreen in it I guess? I’m not quite sure very confused help? Rated 1 out of 5 by Caribbeangirl from Product review I live in the Caribbean and use this product and for some reason my skin became darker. When used in the sun I got this burnt look. My skin is still very dark . Rated 5 out of 5 by Thaimolpiyas from Love this product! Happy Customer. First tried this cream yesterday. Already see a difference. Skin is radiant and looks smooth and bright! Don't change a thing! Ill use this as a night cream as well. Rated 5 out of 5 by Kgardner from Love this product Tried alot of different products because I like a variety, read some reviews on the web and thought I would give it a try. I am so glad I did, I can tell it is working as I have a small area of discoloration (sometimes my hair stylist thinks it’s hair color and tries to wipe it away!) it has definitely lightened this area up, as well as very slight redness on my cheeks I was noticing. As far as any other notable changes, I imagine it’s making improvements! Rated 5 out of 5 by pattym32 from My Favorite Moisturizer I work outside all day in extreme heat and sun. 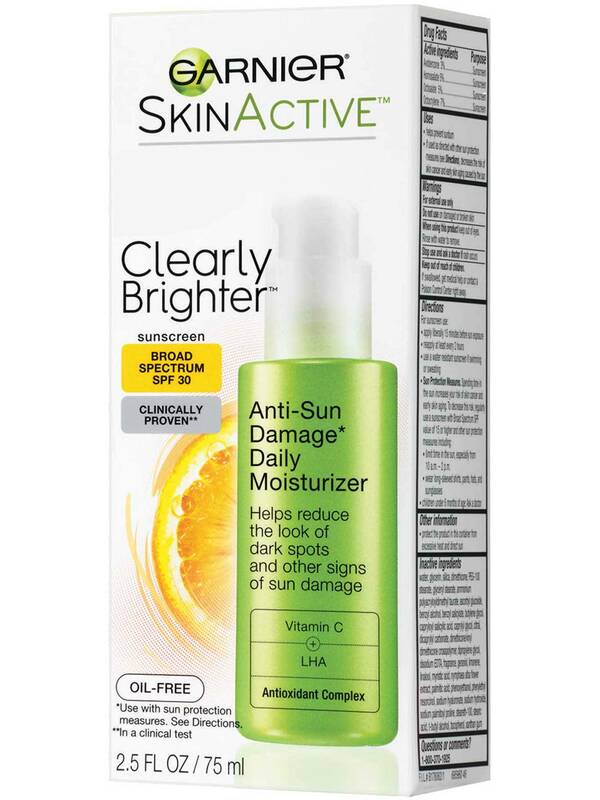 I have tried many moisturizers with sun protection including some very high end expensive brands. This truly is my favorite. Goes on nice not greasy. My skin loves it. I am over 50 and have sensitive skin. I just purchased some more to take to work with me so I can re-apply mid day... 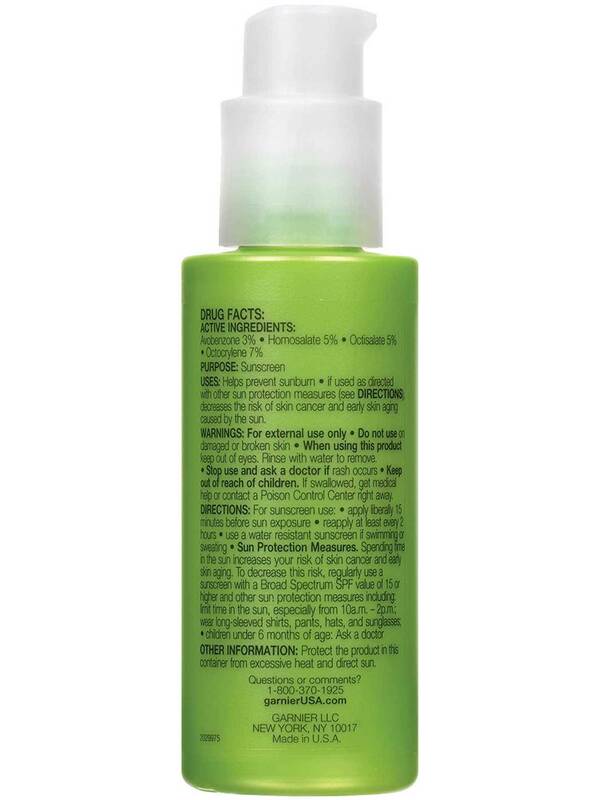 I love love this product!! Rated 4 out of 5 by Amanda F from Greasy but worth it. 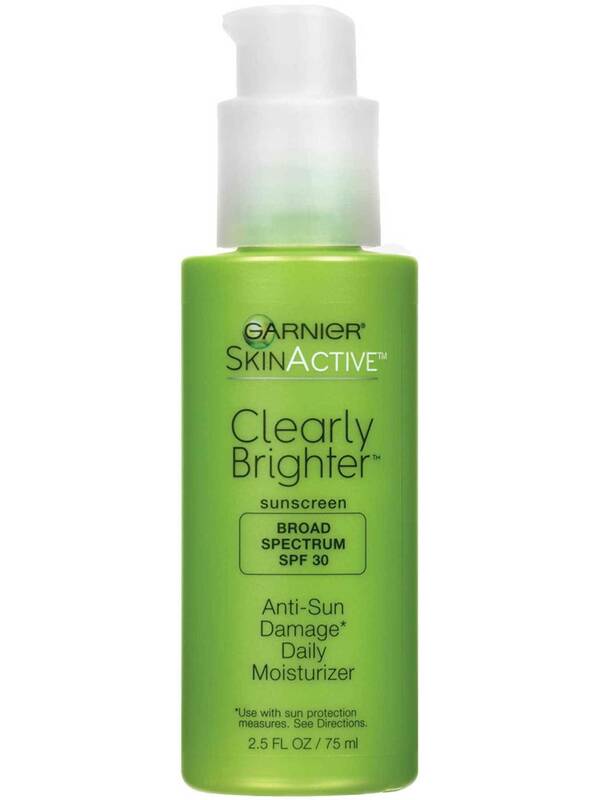 Like all Garnier products this makes my skin feel magnificent and look horribly greasy. It is highly scented but I like the smell. It absorbs nicely and my skin feels hydrated and soft. The LHA doesn't tingle or burn but it's sure working because I haven't had to exfoliate once since I started using this and I used to manually exfoliate twice a week! The benefits outweigh the drawbacks and the price is great for the effects I'm getting so I cover the shine with rice powder and shrug it off. Rated 5 out of 5 by Christen from Love it! I bought this moisturizer a week ago and have already noticed improvements with my skin. My face feels soft, smells good, and the color of my skin feels so much brighter. I have been using the same Clean and Clear Moisturizer for the past few years, but now after trying this product I am never switching back!